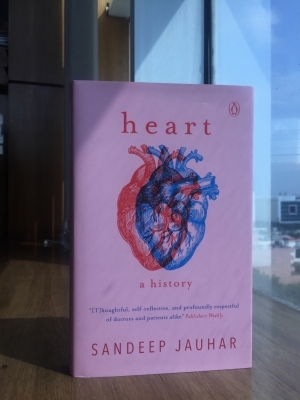 Dedicated to the beating heart Dr. Sandeep Jauhar s latest book Heart - A history provides a thumping tribute to the protagonists -- some legendary some unsung -- of medicine who over the years have innovated and persevered to find cures for cardiac ailments through landmark breakthroughs in their field. Do not mistake Heart - A history as a health digest. Neither is it a prescriptive scribble on how to keep yourself healthy. Heart also spans through progress made vis-a-vis heart care through civilisations right till date while also combining personal anecdotes and heart disease-related stories from Jauhar s own family and his peers. Jauhar s writing style reads like a Arthur Hailey manuscript engaging the reader with ease and keeping you hooked with interesting personal anecdotes historical nuggets factual nuggets humorously-narrated tales of torturous perseverance and recounting how some of the most important inventions related to treatment of cardiovascular diseases were in fact stumbled upon by accident. For example the story of the invention of a pacemaker -- a device which generates electrical impulses via electrodes to contract the heart muscles and at the same time regulate the heart s electrical conduction system -- which it seems was conceived (in a way) in a barn and eventually born thanks to a transistor and a mistake by electrical engineer Wilson Greatbatch. In the 1950s Greatbatch who was testing instruments to monitor heart rate and brain waves in sheep and goats at a livestock farm near New York when he learned about heart block from two surgeons who were around on a summer sabbatical. Years later when he was tinkering with the newly-invented radio transistors he accidentally inserted a resistor in the gadget s circuit which in turn triggered rhythmic pulse. Viola! The pacemaker was born. "I stared at the thing in disbelief and then realised that this was exactly what was needed to drive a heart.... For the next five years most of the world s pacemakers used (this circuit) just because I grabbed the wrong resistor " Jauhar quotes Greatbatch as saying. The "taking charge of the human heartbeat" was a seminal moment in the history of science according to Jauhar because "from antiquity to modern times philosophers and physicians had dreamed of taking charge of the human heartbeat. Like a good doctor humours his patients Jauhar also leaves a trail of humour you cannot miss in his writing which is what makes reading him easy even for the layman. For example when he writes about how the US Surgeon General s caution on cigarette packets eventually came to be in the 1960s he slips in a humorous lozenge in parenthesis like your friendly family doctor. "By the early 1960s a definite association had been also been made between cigarette smoking and heart disease (smokers in previous studies hadn t lived long enough go draw definitive conclusions). This led to the first Surgeon General s report detailing the health hazards of smoking. In 1966 the United States became the first country to require warning labels on cigarette packets " calling the President Richard Nixon era legislation as one of the great public health triumphs of the second half of the 20th century. Through the book the writer also introduces medical professionals like Daniel Hale Williams an African American doctor who performed the world s first open-heart surgery in Chicago; and C. Walton Lillehei who connected a patient s circulatory systems to a healthy donor s paving the way for the heart-lung machine -- legends who redefined heart treatment to the reader. However apart from chronicling the evolution of the disease and medical innovations which tried to arrest and cure heart ailments Jauhar also tries to pitch the reader a more holistic perspective to make the point that medical technology is limited and that control of heart disease largely depends more on the life choices we make. The book is extremely relevant to India where deaths due to heart disease have risen by as much as 34 per cent over the last 26 years.